Reid and Reid in conjunction with the North Carolina Dental Society and the USO of NC are supporting our troops at Ft. Bragg. We are currently collecting new and unused dental supplies in the office. These items will be provided to service members when they deploy and when they return home through rack packs-kits full of health care essentials. There is a donation box located in our office for your convenience. 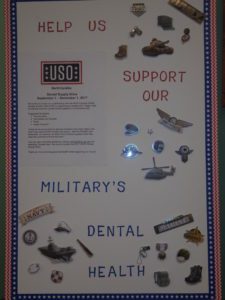 You can also contribute directly by visiting northcarolina.uso.org and selecting “Donate Now.” Be sure to mention the 2017 NCDS Dental Supply Drive.